It’s been one year since Northwest Liquor & Wine re-opened the former state-run liquor shop at 12th and Pine. And what better way to celebrate a one-year anniversary then big jugs of beer. Part owner and manager Eddie Pannu said he will be installing 8-12 taps for growlers this week. Pending approval from the state Liquor Control Board, the store’s custom-labeled growlers will be on sale by the end of the month. 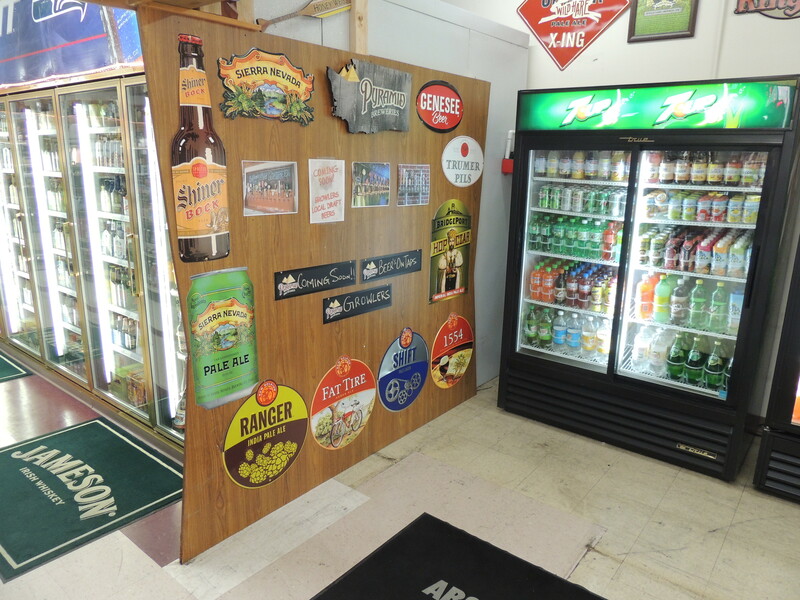 “I didn’t even know about growlers, but customers asked for it,” Pannu said. “We’re always taking requests.” Pannu said he’s still deciding what to offer first (get your requests in now), but will definitely have Mac & Jacks, Manny’s, and a few Ninkasi brews. Pannu also said he’ll be taking advantage of some draft-only beers and special brewery offerings. In 2011 the state legislature passed the bill allowing for stores to sell 32-oz and 64-oz (half-gallon) growlers. The re-useable glass jugs usually cost between $5-8 with many fills priced in the $6-10 range. Pannu said Northwest Liquor will follow suit. With its recent expansions, Northwest Liquor may be an anomaly in the struggling privatized liquor store business. Pannu said other shop owners he knows have been nervous to invest more money into their former state-owned liquor stores. Earlier in the year Northwest Liquor almost threw in the towel, too. In January the owners put the store on the market, citing less-than-expected returns. “We panicked,” Pannu said. “Stores were closing left and right.” Pannu said he and his partners felt particularly vulnerable since they shelled out $500,100 for the store – the highest amount paid in the state’s auction of its stores last year. Many owners, including Pannu, cite the state’s 17% sales tax as the biggest barrier to staying competitive with supermarkets. Northwest Liquor owners said they’re trying to set themselves apart by adding new and unique products. Unfortunately, the owners said prices can’t come down much unless taxes come down first. Nevertheless, Pannu said sales have been growing in the past few months and the other owners are now more confident they’ll stick it out. Gill said he will be working on improving the store’s façade this summer, including putting up a new awning. Word on the hop vine is Chuck’s Hop Shop have pushed back their Central District store opening until August. CHS checked in with owner Chuck Shin in March about his new 20th and Union location, which he said would offer a similarly impressive selection of suds as his Greenwood shop (38 beers on tap, 1,000 bottled beers, and counting). More details to come. The deadline for Capitol Hill Housing to select a new prospective tenant for the Canterbury’s to-be-vacated-by-the-end of 2013 15th Ave E space has arrived. We’re told there is, indeed, a “winner” and negotiations are underway. Much buzz about Capitol Cider opening this week after a month of fine tuning. Stay tuned for more. The Little Uncle Pioneer Square era has begun. Be calm. E Madison’s walk-up will continue on. Li’l Woody’s Ballard opens next week. Capitol Hill patio watch: “￼￼￼￼￼￼￼￼￼￼￼￼￼￼￼￼￼￼￼￼￼￼￼￼￼￼￼￼￼￼￼Featuring a black stone counter and custom-built metal work, the patio will be open all summer long for you to sip the night away.” Rumba also announces an extended happy hour from 4-6p every night. 16 17 new bars and restaurants have opened on Capitol Hill so far in 2013. More are on the way. This retail study helps explain — a little — about how they stay open. Or don’t. Brew Dogs were at The Elysian Capitol Hill, dog. An Eastside success, Ooba Tooba Broadway failed quickly. El Portal Coffee celebrates its first birthday. In case you missed it, the Liberty family of bars will someday spread across Capitol Hill. Dunno about *your* kids but CHS has seen kids at several other Capitol Hill food+drink purveyors. Though this CHS commenter would seemingly disagree. I love Northwest Liquor and Wine already just because their selection kicks the crap out of QFC (especially for liquor), and them adding growlers makes it even more attractive. Any word on when the growler sales will start? If it’s before this Saturday, that timing is perfect for me since I’m having a big party then. :) Doesn’t sound like it’ll be quite that soon though.